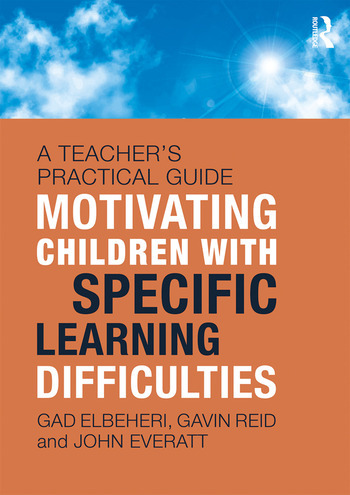 Motivating Children with Specific Learning Difficulties provides a comprehensive and definitive guide to what teachers need to know about motivation in pupils with Specific Learning Difficulties, including dyslexia, dyspraxia and ADHD. Written by three of the world leaders in research on motivation and classroom learning, this book seeks to provide teachers with an increased understanding of why particular strategies should be used with their pupils. It recognises the challenge of motivating children with learning difficulties and looks to help teachers enhance their skills and self-sufficiency. The authors address what motivation is, how to encourage it and the links between motivation and learning. They consider a range of Specific Learning Difficulties in relation to literacy, numeracy, motor development and co-ordination and attention factors in learning. Key issues on learning differences are presented in order to identify and address pupils’ specific needs, and the role parents and educators can play in motivation is also examined. The information and reflections offered in this book will be of interest to teachers across the globe, as well as postgraduate students working towards a qualification in Specific Learning Difficulties. Gad Elbeheri is Dean of the Australian College of Kuwait. Gavin Reid is an independent international educational psychologist based in the UK and Vancouver, Canada. John Everatt is Professor of Education at the University of Canterbury, Christchurch, New Zealand.